Beethoven is most famous for his nine symphonies. The Beethoven monument in Bonn was unveiled in August 1845. Ludwig van Beethoven was a prolific composer and pianist of German origin, and he is one of the famous composers to date. He is an important figure in the transition from the classical music to Romantic era in Western art music. Beethoven showed musical talent at a young age and Johann Van Beethoven, his father, and Christian Gottlob Neefe, a composer, were his teachers. At 21, Joseph Haydn became his teacher in Vienna, and he taught him about composition. During his late 20s, Beethoven began to lose his hearing which progressed until he was almost entirely deaf in his last years. In 1881, Beethoven stopped performing in public and chose to focus on composing. It was during this time he wrote some of his best compositions. Beethoven died on March 26, 1827. In August 1845, the Beethoven monument in Bonn was unveiled making it the first monument ever of a composer. Beethoven wrote 32 piano sonatas, 9 symphonies, 5 piano concertos, one opera, and many more chamber works, which include some ground braking string quartets. The nine symphonies are some of his greatest compositions. Symphony No. 1 was a dedication to Beethoven’s early patron named Baron Gottfried Van Swieten. Hoffmeister and Kuhnel of Leipzig published the symphony in 1801. The symphony was written in C major, opus number 21, and was composed between 1795 and 1801. Symphony No. 1 was influenced by Beethoven’s teacher Joseph Haydn and Wolfgang Amadeus Mozart but has features that make it stand out as Beethoven’s work. The first performance of the Symphony took place on April 2, 1800, in Vienna. Performance of the symphony takes about 22 to 29 minutes. Symphony No. 2 has four movements, and it was written between 1801 and 1802. The symphony is in D major opus number 36 and is a dedication to Karl Alois, Prince Lichnowsky. This symphony was composed during the time Beethoven's deafness was becoming pronounced, and he was starting to realize it may not be cured. Beethoven was residing in Heiligenstadt in 1802. The symphony was first performed on April 5, 1803, in the Theatre an der Wien in Vienna. Performance of the symphony can take 33 to 36 minutes. Symphony No. 3 was written in E-flat major opus number 55. The symphony is also known as Sinfonia Eroica in Italian or Heroic Symphony. The symphony is one of Beethoven’s most celebrated works. Eroica was composed between 1803 and 1804, and it marked the start of Beethoven's creative period. The symphony is long, covers several emotions, and it has been termed as an important signal of the change from Classical period to the Romantic era. Symphony No. 3 was first publicly performed in Vienna on April 7, 1805. There is evidence indicating that the symphony was created back to front. Eroica was at first a dedication to Napoleon Bonaparte during the French Revolution, but in 1804, so as not to lose the songwriter’s fee he was paid by a royal sponsor, Beethoven then dedicated the song to Prince Joseph Franz Maximilian Lobkowitz. Performance of the symphony takes about 41 to 56 minutes. Symphony No. 4 was composed in 1806 during summer, and it is in B-flat major opus number 60. The symphony was first played at Joseph Franz Maximilian Lobkowitz's house in 1807. Symphony No. 4 was a dedication to Count Franz Von Oppersdorff. The count had heard Symphony No. 2 by Beethoven and offered him money to compose a symphony for him. It takes 33 minutes to perform this symphony. Symphony No. 5 was written between 1804 and 1808, and it is in C minor, opus number 67. The symphony has at times, since the World War II, been named the Victory symphony. The symphony is one of the most repeatedly played symphonies making it well known. Beethoven took a break several times while writing this symphony to compose other pieces. Beethoven was in his mid-thirties while writing this symphony and his deafness was increasing, causing turmoil in his personal life, and there were several ongoing wars during the period. The symphony was first played on December 18, 1808, and with Beethoven directing the orchestra. Symphony No. 6 also premiered on the same day, and it played before Symphony No. 5. The symphony was a dedication to two of Beethoven's sponsors Count Razumovsky and Franz Joseph von Lobkowitz. Symphony No. 6, also named the pastoral symphony was written in F major opus number 68. The symphony which contains five movements was completed in 1808, and it premiered alongside symphony No. 5 on December 22, 1808 in Theatre an der Wien in Vienna. Beethoven mentioned that the Symphony No.6 is “more expression of feeling than painting.” This symphony contains more of program music. In 1940, the symphony was used in animated film Fantasia, although with some alterations in its length. Symphony No. 7 was written between 1811 and 1812 in A major opus number 92. 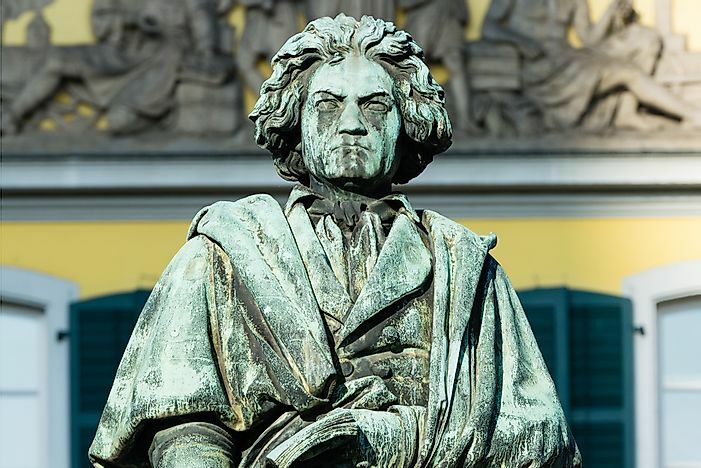 While writing this piece, Beethoven was recuperating in Teplice. Symphony No. 7 was a dedication to Count Moritz von Fries. The symphony has four movements and was premiered was on December 8, 1813 with Beethoven himself conducting. The symphony lasts about 44 minutes. This symphony was written in 1812 in F major opus number 93, when Beethoven was 41 years. Beethoven referred to it as ‘my little symphony in F' to differentiate it from Symphony No. 6 which is also in F major. Beethoven wrote this piece in four months with no dedication put into it. Though the symphony is cheerful and is noted as light-hearted, Beethoven had a lot of unpleasant incidences in his life at the time of writing. The opening of the symphony was at Vienna on February 27, 1814, but it was not well received. The symphony lasts 26 minutes and ends with a good humor on a extremely long passage of loud tonic harmony, which Tchaikovsky refer to as one of the Beethoven’s greatest masterpieces in symphony. This symphony is the last complete symphony by Beethoven and was written between 1822 and 1824. The symphony was played first on May 7, 1824 and was written in D minor, opus number 125. This symphony was a choral symphony and was the first ever composition with voices in a symphony. Symphony No. 9 is played widely around the world. The voices come in towards the end of the symphony. The words in the symphony are from the Ode to Joy poem which was written by Friedrich Schiller. In 2001, the score’s manuscript, written by Beethoven, was added to the United Nations Memory of the World Programme heritage list making it the first sheet music to receive such honor. The manuscript has been preserved in Berlin State Library. By 2010, the symphony had become the most performed in the world. During the Cold War when Germany was divided, the Ode to Joy part of the symphony was played instead of the national anthem during the Olympics Games for the unified of Germany. The symphony was also adopted in 1972 by the Council of Europe as the anthem of Europe which is now the European Union.